A.Wright and Son Limited – http://www.penknives-and-scissors.co.uk – make scissors, cutlery, kitchen knives, pen and pocket knives, hunting knives, sheath knives, British Army knives, ettrick knives, boating knives, throwing knives, commando knives, bowie knives, bushcraft and survival knives. Started in 1947, Arthur Wrights is a traditional Sheffield Pen and Pocket knife manufacturer. Everything is done in-house in Sheffield. The quality of their products is excellent and they are good value for money. I have an Arthur Wright 70W 70mm Farmers Sheepfoot Pocket Knife and it really is a sturdy no-nonsense knife and a fabulously useful tool. My 70W Farmers Sheepfoot weighs 80 grams (2.8 oz), has an overall blade length of 70mm (2.75″), a straight cutting edge of 63mm (2.48″) and an overall length of 158mm (6.25″). 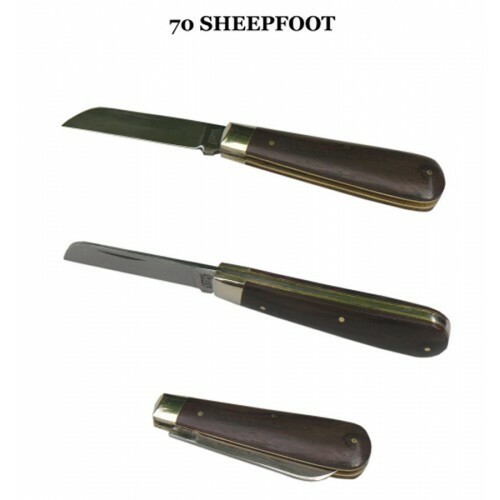 The Farmers Sheepfoot Pocket Knife is iconic and very much a traditional country knife. Arthur Wright 70W Farmers Sheepfoot. A sturdy no-nonsense utility knife with a wide blade, brass linings, nickel bolsters and Rose Wood scales on handle. 70mm blade. Made in England. Arthur Wright 70W 70mm Farmers Sheepfoot. Made in England. This entry was posted in Bison Bushcraft, Gardening, Knives, Medicines / Medical, Penknives, Pocket Knives, Safety Knives, Scientific Equipment, Sheffield Knives, Survival knives, Ten uses for a pocket knife and tagged A.Wright and Son Limited, Austin McGillivray and Co, Bison Bushcraft, BLADE-TECH Knife Sharpener, British Army Knife, British Made Pocket Knives, Bushcraft knives, Craven & Co. Ltd, Crisp & Sons, Durham Duplex, e-Bay, EDC, Eggington, F.E. and J.R. Hopkinson Ltd, Finisterre, Friday Fox, Garden tools, Gardening, Gardening tools, George Wostenholm, Granton Knives, Granton Medical, Hector Russell, Heinnie Haynes, Herbert M. Slater (1853) Ltd, J. Adams Ltd, John Nowill and Sons Ltd, Joseph Rogers, Knife Law, Knives and airports, Lifeaxe, machete, Made in England, Made in Sheffield, Matchets, MSE (UK) Ltd, Oilstone, Oilstone and box, Pen Knives, Penknife uses, Penknives, Platts & Nisbett, Pocket knife uses, Pocket Knives, R & R, Ragg Tuning Forks, Ralph Martindale & Company Ltd, Reg Cooper, Safety Knives, SAKs, Samuel Stainforth, Scissors and airports, Sheffield, Sheffield Knives, Sheffield Steel, Simply Sheffield, Skidmore OEM, Slater Knives, Spyderco, Stanley Knife, Survival knives, Swann-Morton, Swiss made Swiss Army Knives, Taylor’s Eye Witness, Ten uses for a pocket knife, The Chillington Tool Company, The Eggington Group, The Famous Sheffield Shop, The Lofty Wiseman Survival Tool, The Safety Knife Company Ltd, Tools, Trevor Ablett, Uniplex UK Ltd, Uses for a penknife, Uses for a pocket knife, Victorinox, Wenger, William Rogers on January 10, 2013 by ukmade.